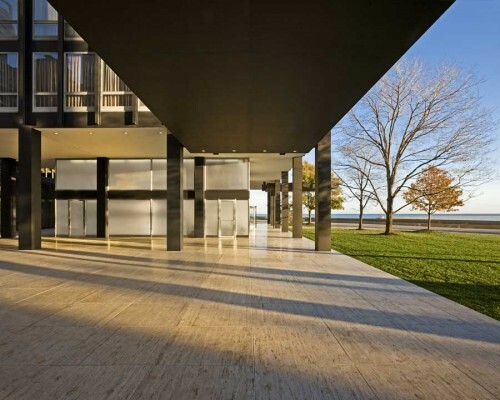 Architects Krueck & Sexton restored one of legendary Modernist Ludwig Mies van der Rohe’s most celebrated commissions back in 2010: 860-880 Lake Shore Drive in downtown Chicago. 860-880, which was built between 1949 and 1951, consists of two 26-story, exposed steel and glass apartment towers set at right angles on an irregular travertine plaza. 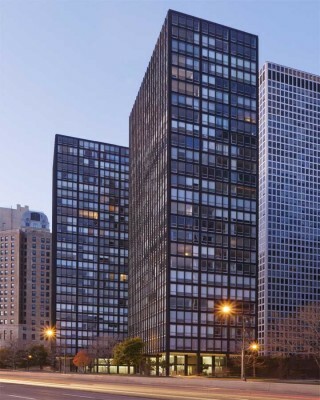 Based on ideas and theories Mies had been perfecting since his earliest days as an independent architect in 1920s Berlin, the 860-880 Lake Shore Drive buildings redefined highrise living for the post-war generation. 860-880 Lake Shore Drive, which is both a local and national landmark, is located just north of Chicago’s Loop central business district and steps away from Lake Michigan. 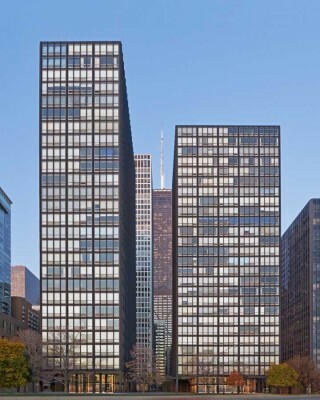 Many architects and critics believe 860-880 Lake Shore Drive Towers is the closest Mies ever came to achieving his goal of less is more “skin and bones” architecture. In addition to more than half a century of normal wear and tear, the 860-880 Lake Shore Drive buildings had endured several restoration attempts over the years. The problems included corrosion of the buildings’ exposed steel frame, failure of the lobby glazing system and extensive cracking and discoloration of the travertine plaza. There were also aesthetic issues. The original frosted glass in the lobby had been replaced in the early 1980s by a laminate system with a translucent interlayer that created an historically inaccurate aquamarine tint. The 860-880 Lake Shore Drive restoration included recoating the steel frame facade and cleaning the original aluminum windows. In addition, new sandblasted glass in the lobby recreated the soft, velvety glow of the original. Finally, the plaza was rebuilt, a process that included replacing the original travertine slabs, designing a new drainage system and recreating the original plaza lighting scheme. Designed to take advantage of a 2008 tax credit, the 860-880 Lake Shore Drive renovation project began in the summer of 2007 and was completed in December. The cost was $9 million. Krueck & Sexton began work on 860-880 Lake Shore Drive Towers in the summer of 2007 and finished in December of 2009. The preservation architect was Harboe Architects, also in Chicago. The total cost of the 860-880 Lake Shore Drive project was $9 million. The problems included corrosion of the building’s exposed steel frame, failure of the lobby glazing system and extensive cracking and discoloration of the travertine plaza. 860-880 Lake Shore Drive is the third and largest Mies commission Krueck & Sexton, a firm more noted for its original work, has completed in recent years. The other two – all are in Chicago – are Crown Hall on the campus of the Illinois Institute of Technology and the School of Social Service Administration at the University of Chicago. Krueck & Sexton Architects was founded by architects Ronald Krueck and Mark Sexton in 1991 and is a multi-disciplinary firm with a varied portfolio. 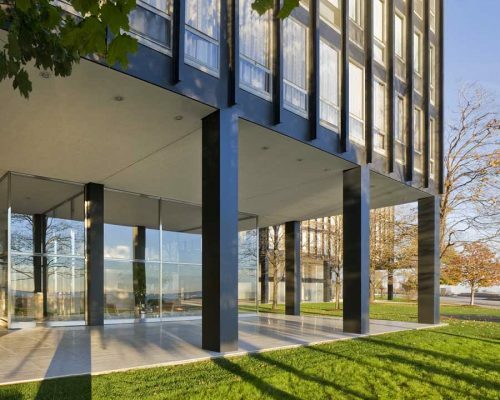 In addition to its innovative Mid-Century restoration and renovation practice, it has completed numerous award-winning civic, commercial and residential projects. The firm’s Spertus Institute Building on Michigan Avenue in Chicago received three AIA awards in 2008, including a Distinguished Building Award. The firm currently is working on a 25 acre expansion of Grant Park in downtown Chicago, the highlight of which will be a new home – also designed by Krueck & Sexton – for the Chicago Children’s Museum. Widely recognized as one of the 20th Century’s most iconic residential projects, 860-880 Lake Shore Drive consists of two 26-story rectangular condominium buildings surrounded by an irregular travertine plaza. The steel and glass towers are connected by a covered walkway.